New tsunami warning protocol rolled out in B.C. The B.C. government is upgrading its tsunami warning plans following delays broadcasting emergency information after a magnitude 7.7 earthquake last month. After the quake struck off the west coast of Haida Gwaii on Oct. 27 at 8:04 p.m. PT, emergency officials in B.C. did not issue any sort of tsunami alert or advisory for 51 minutes, leaving many civic leaders in B.C. wondering what they were supposed to do. But many communities did start evacuations based on notifications issued by U.S. officials just minutes after the quake was detected. After questions about B.C. 's response, Justice Minister Shirley Bond ordered a review of the notification protocol, and on Monday she rolled out the changes. Under the new protocol, when emergency officials in B.C. receive an alert or advisory from the West Coast and Alaska Tsunami Warning Centre, they will immediately email it to a list of prioritized local authorities, emergency responders and media outlets. The alert will also be immediately broadcast on Twitter thru the @EmergencyInfoBC account and posted on the Emergency Info B.C. website. Provincial emergency officials will then follow up with direct phone calls to local authorities starting with those in areas of highest risk. The system appeared to be in operation when a magnitude 6.4 earthquake struck about 248 km off the coast of Alaska on Monday afternoon at 12:42 p.m. PT. At 12:46 p.m., the @NWS_WCATWC twitter account broadcast a message saying there was no tsunami danger for the West Coast from Alaska to California. A modified version of the tweet was retweeted on the Emergency Info B.C. account at 12:50 p.m.
A mobile version for use on smartphones. Development of an interactive map for tsunami warning zones. Digital audio recordings of tsunami warnings posted online. Justice Minister Shirley Bond said the changes are the direct result of a review that was conducted following the Oct. 27 earthquake. "We made a commitment to review our earthquake and tsunami response and we are now taking action to implement some of the early recommendations identified," said Bond. "We have also been in direct contact with those mayors who expressed concern about B.C. 's emergency response reaction time and have communicated with regional district board chairs, local authorities and first responders, gathering their feedback." 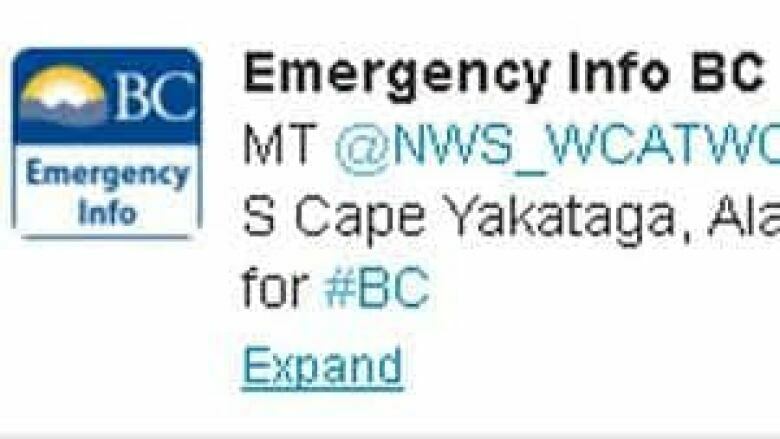 Follow @NWS_WCATWC and @EmergencyInfoBC on Twitter. To receive SMS updates text 'follow NWS_WCATWC' and 'follow EmergencyInfoBC' to 21212. Get more detailed instructions on signing up for Twitter SMS alerts: http://ow.ly/f8slJ. Visit www.emergencyinfobc.gov.bc.ca for the latest emergency information.